A busy and mostly Spanish club just west of Málaga. Founded about 30 years ago. The clubhouse is old-style buildings around a central courtyard. Much better architecture than many clubs that do Spanish taste badly. In that respect, Guadalhorce is the real deal. Charming, nice. This is not really a Costa del Sol club, more a Málaga club. It is absolutely a parkland course. Very flat. No fairways have significant slope (across the fairway) or elevation (along the fairway). An easy course to walk. Some tee boxes and greens are mildly elevated, but seldom by more than a few meters. The trees along the fairways are very mature, in this case quite small height species. The fairways are medium width, and you are not punished much for an errant shot because of 1) lack of slope, 2) close-by adjacent fairways, 3) no significant rough or other hazards between fairways. At most between fairways you might find small mounds of earth maximum 2 meters high. The water hazards are in play on 3 holes, but there is always a safe line to avoid them. The 11th hole par 3 has dangerous lateral water hazards, and is the closest this course gets to a 'signature hole'. Bunkers are quite easy. Flat-bottomed with angled sides (the way they rake them) plus a fair degree of bunker lip. The fairway bunkers are not much in play – easy to avoid. The blob-shaped green-side bunkers also trap only quite bad shots. The bunker sand is large-grained and high quality. Every green – even from 150+ meters out – offers a quite easy approach shot line. All grass on this course is mowed short. It is almost impossible to find any deep rough. This extends to the areas close to the greens. So both pitching and chipping onto the greens is easy – you can often have a choice of a bump-and-run shot, a high lofted shot or even taking a putter for your first shot off a green onto the green. The greens are quite large. On the front 9 much deeper (front-to-back) than wider. They are gently undulating. I played once and thought the greens notably slow and bobbly (the ball on your putts bobbles along on the way to the hole). I think that was due to the greens not being mowed quite enough. The next time I played the greens were tightly mowed, very smooth, medium-speed, consistent and very nice. Both the fairways and greens have a wide variety of grasses, so the whole course looks a bit patchy. But this appearance is misleading – the course certainly plays consistently however the grass looks. The greens also are flecked with old pitch marks. None of this affects your pitching or putting much. I think Guadalhorce an easy course. Easier than the official rating (see below). The length of this course is not a problem given how easy it plays. There are high-quality plastic hole maps on every tee box. The holes are repeatedly straight along the landscape. I think this course very simple. For me, nothing really exciting, interesting or challenging. It seems the club knows they have an issue here. There is talk of their reworking some holes on the back 9. This club is situated in the Western outskirts of Málaga. If you visit the club, get the directions (satnav, directions from the Guadalhorce Web site, map sites on the Internet..) together before you set out. The club is not easy to find. The personal service I (speaking only English with very poor Spanish) got at this club was excellent – friendly and helpful. I guess the club is deliberately being welcoming to non-Spanish visitors from areas West along the Costa – to attract more of that business. The course is not expensive at all, including trolley rental. I like the club atmosphere a lot. And the value-for-money is very good, not just for the golf. I had a good hot food plate and large beer for only 10 Euros. The detailed course booklet (showing each hole layout in detail) was only a few Euros whereas some clubs on the Costa del Sol charge around 10 Euros or more for the same thing. However this is simply not my sort of course, so I will not be going back there frequently. 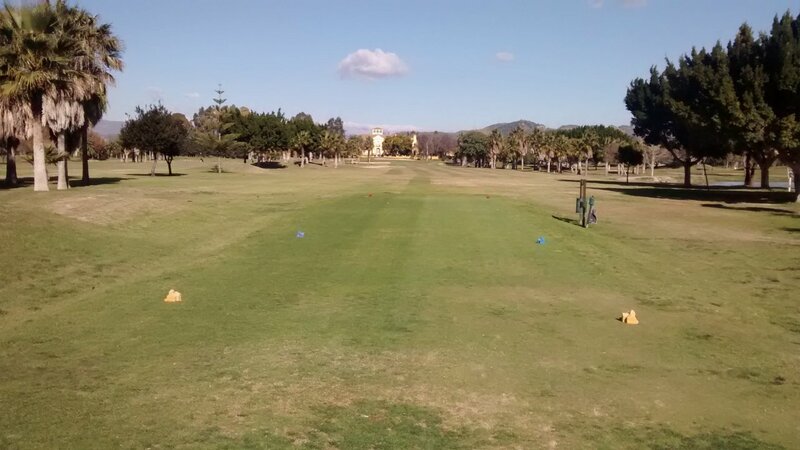 I find it difficult to recommend Guadalhorce to low-handicap players (just too easy and simple a course for them). 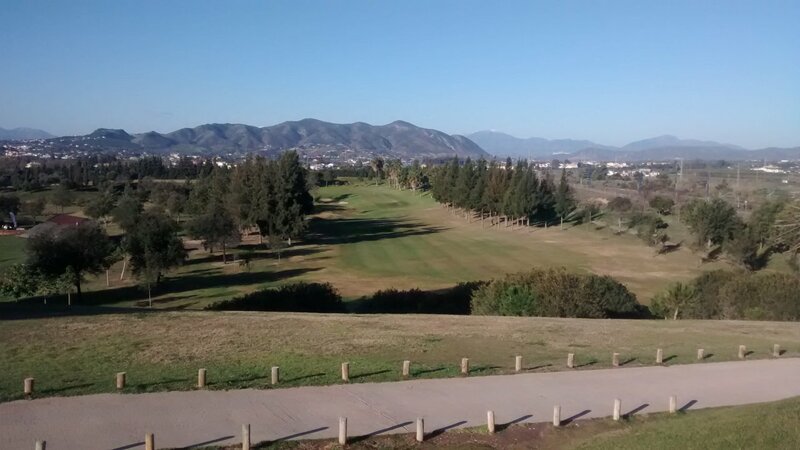 High-handicap players looking for an easy walking course where they will not lose a lot of golf balls will like Guadalhorce. Also a nice course for beginner players moving up from 9-hole courses to 18-hole courses. Mid-handicap players should have no problem playing to their handicap here – more a course for a practice round than a full-on challenging round. Worth a visit if you have the time and want a change from the other courses on the Costa del Sol. But still not a 'top 10' course for the type of golf experience I personally want. Review last updated: February 2015. Number of times played: 2. Guadalhorce is represented by the yellow dot. This shows that the course is slightly above average length and difficulty compared to all other courses on the Costa del Sol. 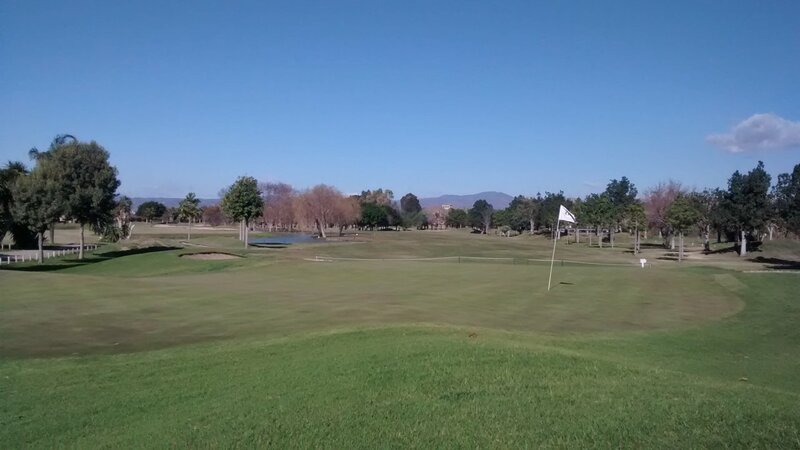 An 18-handicap player can expect to go around this course between 20 and 21 over par.